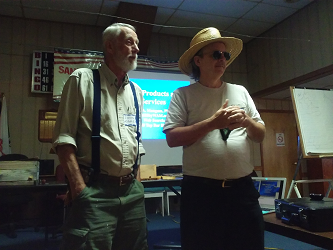 I was fortunate enough to be able to attend the convention in Sandston, Virginia, which turned out to be one of the best fellow bee conventions I have attended. The first speaker was John Adams. He has been working with bees since 1974. John’s subject matter was the long box, bait hive construction, honey extraction, wax extraction, art, metaphysics, and the honey bee. John first talked about the long box and how he builds them, what type of materials to use, and the dimensions. John has gone from a 31” to now 24” length, by 14” deep, which helps make for easier handling. The long box can be set up on concrete blocks or tables for less stress on the back and harder for critters to get into. John talked about how the queen lays in circles and that 80% of comb needs to be covered by bees or the hive beetles will take over. John also talked about how the propolis is the immune system of the hive. 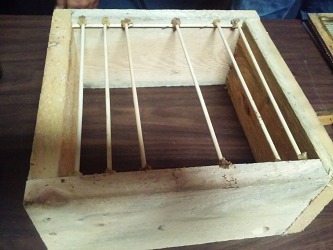 The next subject was on bait hives and how they should be set up before nectar flow. If you have some old black comb, put it on metal and it will melt under the sun, giving off a smell that will attract and cause a swarm area. 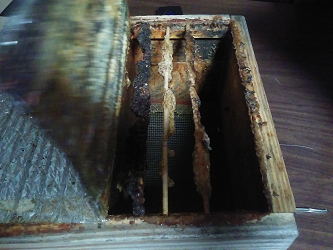 In bait hive use empty comb. After talking about bait hives the subject went to honey extraction. Since this conference mainly talked about top bar hives, learning about how to extract without spinning the comb was useful. The methods are not complicated, the comb can be placed in a bag and crushed. A hole can be placed through the bag to then allow it to drain into a container. Steam can be used to separate honey and comb; a solar extractor can be used by using a glass door on hinges which will allow the honey and comb to heat up and separate. The honey can be filtered into a 5-gallon bucket by using a strainer. Use nylon filter and not cheese cloth. Cheese cloth will allow fibers in honey. The last method of extraction is cut comb. A can with cuts placed at the end like a cookie cutter will allow even round cuts of comb that can be place in containers. 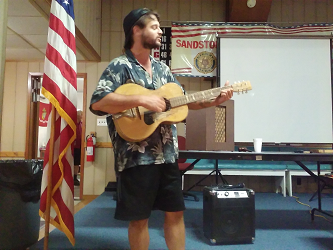 The next speaker was Keith Tignor, State Apiarist. Keith talked about some of the myths in beekeeping and the facts about beekeeping. Tinning, a practice of beating metal to attract swarms. This in fact came from times of the Romans that the beekeepers would bang metal to make noise when chasing a swarm, to warn of their crossing of someone else’s property. If at right frequency the sound could cause a swarm to light on a bush or tree close by. Smoking hives, bees fill up on honey due to forest fire. However, bees fill up on honey due to disturbing the hive. The smoke binds to pheromone receptors and will mask the alarm pheromones. Comb cell size, bees naturally build small cells. Bees build a range of cell sizes dependent on the strain and template. How far do bees fly? Only as far as they have to. Parting words, at some point people might want to consider a collective apiary, due to cost and the shared resources. The next speaker was Dr. Wyatt Mangum. Topic was Hot Bees, Thermal Camera in the Apiary. Wyatt showed several pictures of using thermal imaging to determine where the bees were at in a hive, if bees were in the hive, and if the hive looked healthy or strong. This could all be done without opening the hives up. The bee yard could be quickly inspected and images recorded for future reference. This was done by using a product called Flir, which attached to his iPhone to take thermal images. The camera adapter cost about $250.00 and the iPhone needed to have max memory. This device can also be used to locate feral colonies for bee extractions. The walls of a home can be viewed and the activity assessed without tearing apart anymore wall than what is needed. The last speaker was Sam Comfort of Anarchy Apiaries. Sam’s primary topic was breaking the brood cycle. Sam talked about how he got into working with bees and how he learned from commercial bee keepers all the practices that are used to try and save the bees. The commercial bee keepers are always doing hive splits to try and replace the bees that die off. Sam, after working with commercial bee keepers for a number of years, wanted to try something a little more sustainable. Sam has grafted about 3,000 queens this year for his use and for sale to other bee keepers. He has not medicated his bees since 2005 and does not need to medicate. When the brood cycle is broken, either by swarm or introduction of a new queen, the varroa mite loses out on its numbers and helps get rid of them. The bees do not have to produce royal jelly and you get super bees that live longer and are stronger. Sam uses top bar hives, as do the other speakers. But, one interesting type of hive is one I will call the Sam Comfort Hive. It can be made from rough cut lumber, 1”X6” or from pallet wood. The hives are small and can be used for raising queens and nucs. The bars are shish kabab skewers. Sam suggested to have one or two nucs for every hive you have for back up. He does this by doing splits all the time. Sam doesn’t wear any bee veil or suit. So, when he is working with the bees and making splits or inspecting, he does get stung, but it doesn’t bother him. He says it has made him work with the bees slower so they do not get upset and want to sting. Sam mentioned a few resources that he likes, such as KirkWebster.com, Russian Bees, Treatment Free, the CC Miller Method of cutting zigzags in comb, and Tom Sealer, Honey Bee Democracy. Two quotes from Sam are; “Are you making bees every year or buying?” and “Don’t breed from dead bees.” In other words, produce local bees and don’t get upset if bees die. They are the weak ones. All in all, this was a very informative convention. With instructions on top bar hives, natural bee keeping, and techniques for keeping healthy bees. As Sam said, if you are starting out bee keeping, don’t buy anything, catch a swarm and make your own hives. Bring a your person to your next bee meeting or to your bee yard.